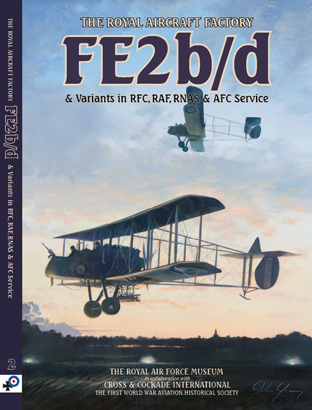 "Royal Aircraft Factory FE2b/d & Variants in RFC, RAF, RNAS & AFC Service"
Softback, 200 pages, 210 x 297mm. The history of Henry Folland's initial design, the FE2a through FE2b/c/d to h; details training, day operations, night bombing, home defence, experimental developments, marine operations; Presentation and aircrew indexes and a full serials listing. Contains over 420 photographs; plus colour profiles, and 14 pages of 1:72 scale drawings and airframe development. Book £25.00 Sorry! Out of stock. This is the story of the FE2b and its variants, a long story, that began before the First World War and continued beyond, encompassing on the way many episodes of heroism and success as well as tragedy. The FE2b is a victim of that strange law of aircraft preservation which generally ensures that, the more of a type were built, the fewer the survivors. In fact there is no complete original. 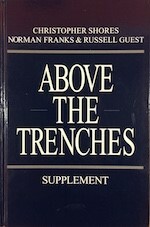 So it comes about that this first full-length study of the type, researched and produced by Cross & Cockade International in collaboration with the Royal Air Force Museum, will be published to coincide with the unveiling of a reconstructed aircraft, based on surviving original components, to be exhibited in the Museum’s Bomber Command Hall.